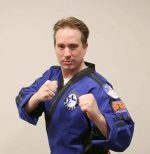 Sensei Cory has been studying Martial Arts for over 28 years and has been an instructor with ACTIVSTARS since 2010. His main style has been Toushi Kan, which is a mixed form comprising of Shotokan Karate, Taekwondo, and Hapkido. He has a passion for the Martial Arts, and is committed to giving his students important life skills, which include respect, integrity, self-control, and perseverance. He feels one should always continue to improve and learn; doing the best one can in all that he/she does.